For me beauty doesn't always have to cost a bundle, in some cases you can find higher quality products at your local drugstore or even supermarket (coconut oil!). 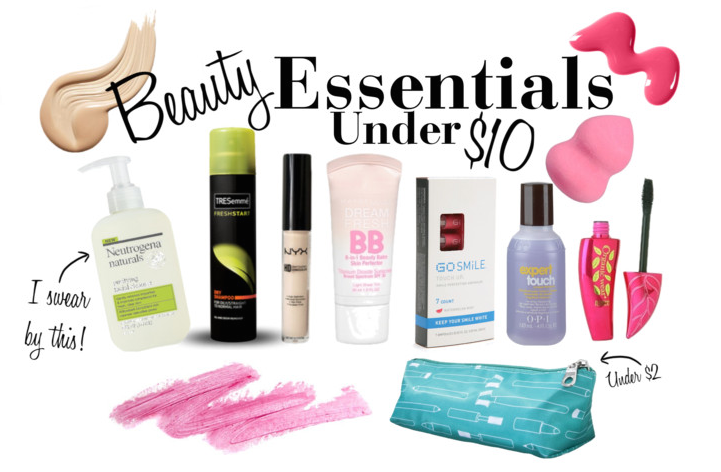 And as it would turn out a lot of my most used essentials are under $10, lucky for me and my face! From Mascara to Cleansers, and Concealers this list comprised mostly of items I just can't live without has you covered, and for under 10! What's your favorite budget beauty find? I've been using this for the last year and I swear by it and my skin refuses to like anything else, it's amazing and perfect for my sometimes troublesome skin. Another Pre-Fashion Week Find, that brightens my eyes and helps high those nasty dark spots.. I think this is my favorite BB Cream so far, expensive and drug store wise, it actually makes my skin look better after washing it off, plus sunscreen is always a win. Simple Touch Ups On The Go, Yes Please. How Cute is This and Under $2, Throw it in your purse and get one for a friend at that price! I first met a real beauty blender at Birchbox's Sample Stop back in September and since them have been obsessed, luckily this one is pretty close to both my beauty blenders at a 1/4 of the price. My only real beauty product is from Jonathan Products, Dirt. It is a hair paste and really helps pep up my locks. Only use it on special occasions though. I've heard great things about the BB cream! I am obsessed with dry shampoo, it is the best product I have ever used. I use it most days it is incredible. Great for volume too. The maybelline bb cream is my fave. i don't like wearing foundation, so this is perfect for me. that makeup bag is cute and for under $2?! what!? I really like the look of that mascara! Awesome list!! I need to check out that mascara!! The stuff I'm currently using is horrible and I just bought it!! I used to have a blender sponge just like this and loved it! I think I spent $10 at Target though so I'll have to check out Ulta! Totally want to try that mascara now too! I use physician's foundation.